We will be back to finish section 10 in 2 weeks or start section 12, depending on the many other deciding factors in our lives at the moment. Either way, happiness will win because we’re going to hike whether we hit the trail in the morning or after 6pm again. 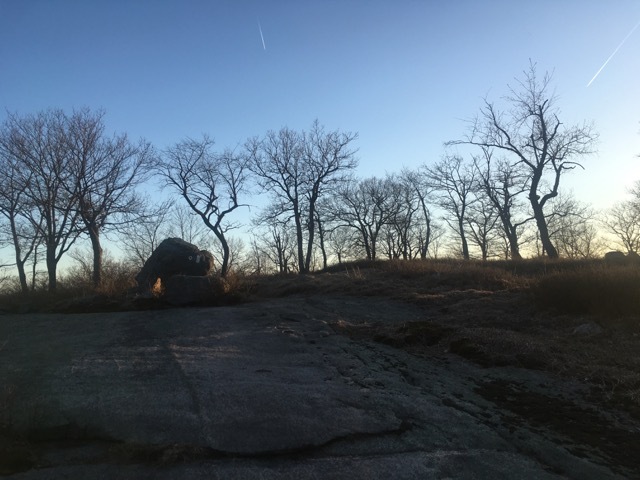 Last weekend it was about 645pm by the time we got on trail, as the usual rush hour traffic was multiplied by the fact that it was Friday, gorgeous weather forecast all weekend, and the first day of spring break for my kids and many other schools! We also slightly overshot the turnoff to the parking lot off Arden Valley Road and there wasn’t really a safe place to turn around on this road until a camp entrance a few miles later. So that ate a little time too. 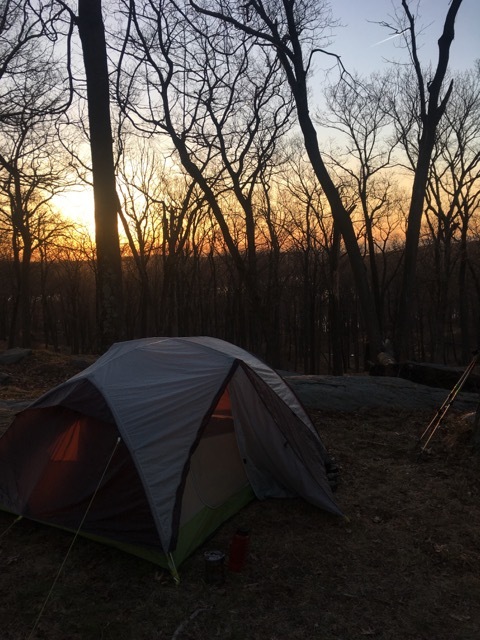 Fortunately, daylight savings recently kicking in and the less-forested mountaintop location of the trail and campsite gave us adequate light until almost 8pm and it was a short 1.5 mile hike in. Section 11 starts just a quarter mile up a blue trail from the lot, and follows the spine of Fingerboard mountain. 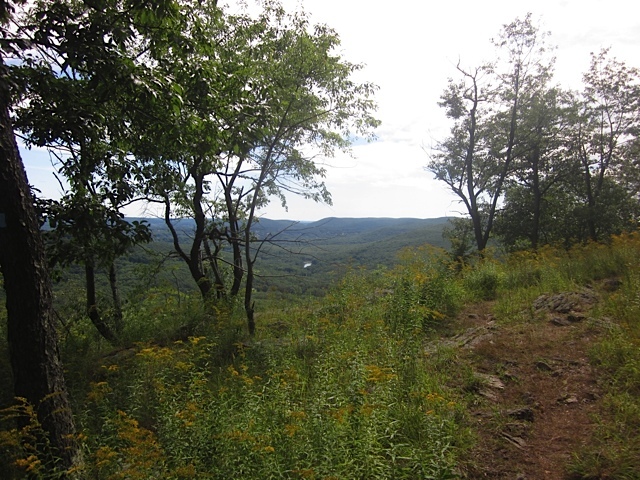 Here the A.T. undulates gently up and down along its ridge, sharing the route with the red-dot-blazed Ramapo-Dunderberg Trail. As I mentioned in our blog a few weeks ago when we were on the southern end of it, it is the oldest trail in the park and some 28 miles long. 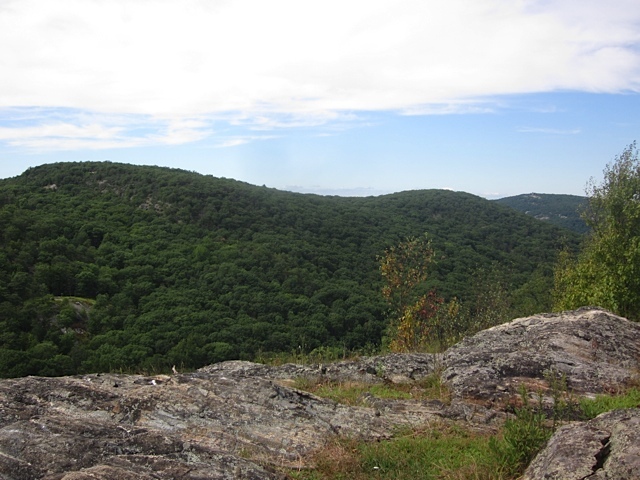 I have been on another portion of the Ramapo-Dunderberg myself as well when doing a solo hike last summer. It has a lot of great views and some quite challenging terrain at times. In this area, the two trails’ shared route begins a few miles north of where we started today’s section and ends just south of our camp for the night, Fingerboard shelter. 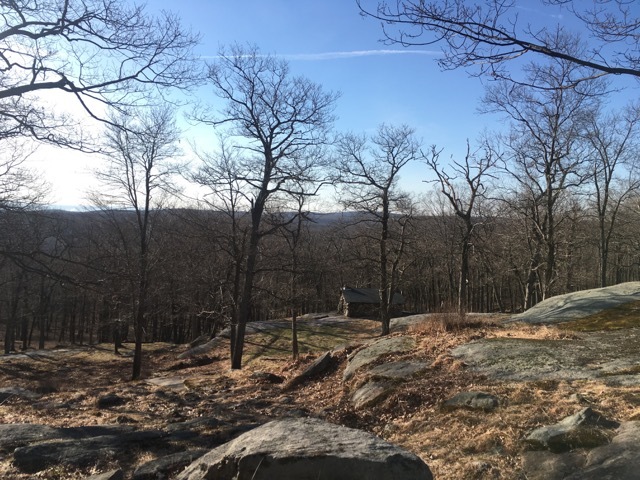 The shelter is of the original stone style Harriman State Park is known for, and sits just below the summit at around 1380ft. 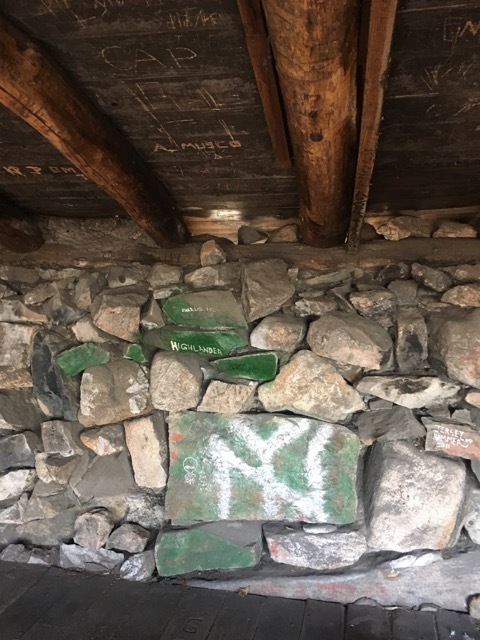 West Mountain shelter, William Brien shelter, and all the others in the park are all also made out of stone as are the other buildings throughout the park areas, including the Inn at Bear Mountain, administrative buildings, and bathrooms. We were treated to a beautiful setting sun on the western side of the ridge as we walked in to camp, and met a friendly deer, who moved only slightly out of our way to continue her meal. When we reached the shelter we said hello to a nice younger couple and found one of the many beautiful spots there to camp. 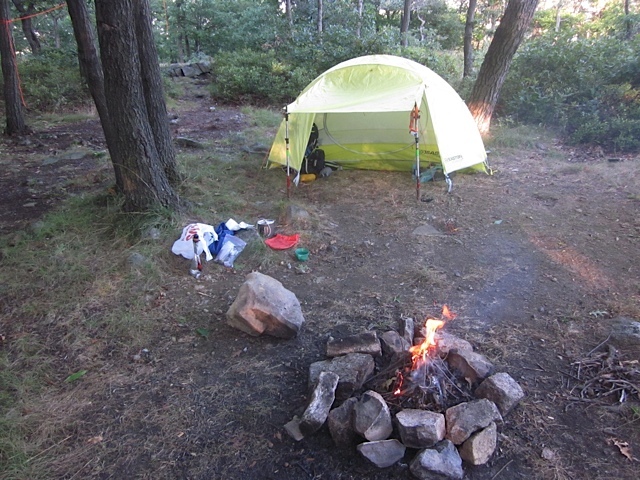 I hung the bear bag with my new Nite Ize reflective line and we set up the tent. While that line is a bit bright and maybe considered an eyesore to some, it sure beats wandering around on uneven ground in the dark trying to find the line when its time to hang the bag before bed. Nothing ends a hiking trip faster than a bad fall or sprained ankle! I also bought it with more isolated campsites in mind but this one just happened to be large enough for 40 people, not including the shelter! 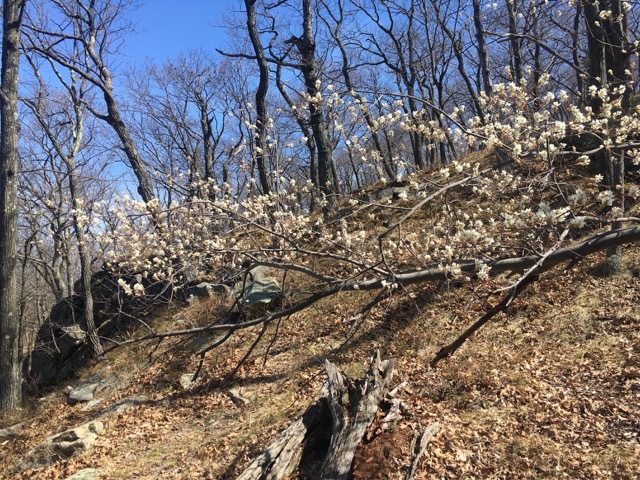 There’s a small seasonal spring at the bottom of the hill along the blue trail that goes from here back down to Seven Lakes Drive along lake Tiorati. According to my A.T. guide, Tiorati means “sky-like” in the native Algonquin language. Also according to my guide, it is a man-made lake. Where we parked there is a traffic circle with a beach area, concessions, bathrooms, and a large picnic area which must be quite busy during the summer. While the lot was empty when we parked, it was almost full when we returned to our car the next afternoon. While not quite swimming weather, it was after all a gorgeous weekend. 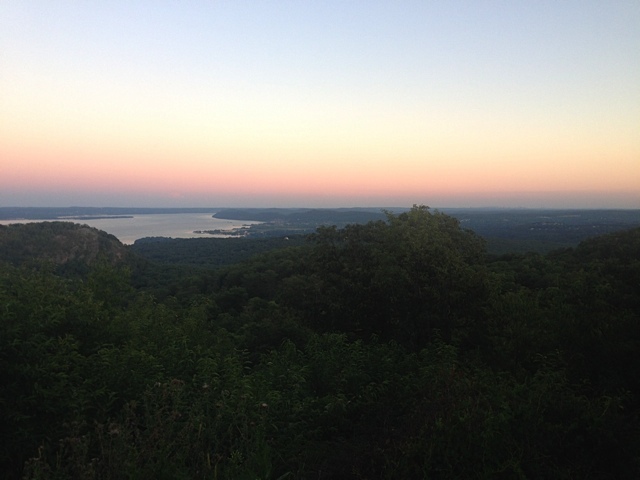 The walk in along the ridge and the higher camping spots near the shelter had some great views beyond the lake to the Hudson as well, and the twinkling lights of what I believe was Peekskill, New York on the eastern side of the river. Not quite as grand a view as West Mountain shelter, but close! Temperatures were to get down to the mid-30s though it was hard to believe until the sun set. We had dinner and made a fire in the main fire ring with the other couple as a few other overnighters settled in. We didn’t really chat with any of them, as they made their own camp further down the hill, but we did see a father-son pair from the campground the next morning on the trail. Around 930 or 10 we went to bed, which is later than usual for us, but we do usually get into camp a lot earlier. I was a bit cold until I eventually I put on my raincoat and that got my body temperature to its right place. I didn’t bring the down coat this time. Fielden Stream got bundled up in her new bag, which is part of the Big Agnes intergrated sleep system and has a pouch where her sleeping pad slides in. I was envious of the fact that her pad and bag were one and there was no way to slip off the pad. But I do like my new bag and pad, and I brought both sleeping pads again. I will probably just keep doing this when the nights will be colder, and then stick to one or the other over the summer. We slept quite well, though I had to make a few bathroom visits on account of enjoying a few luxurious trail beverages! The next morning we made my favorite trail breakfast, grits with parmesan cheese. While this is a tough one to clean, we do it when we know we’re just out for the night and can clean the pot easily when we get home. We then packed up, said goodbye and hit the trail. 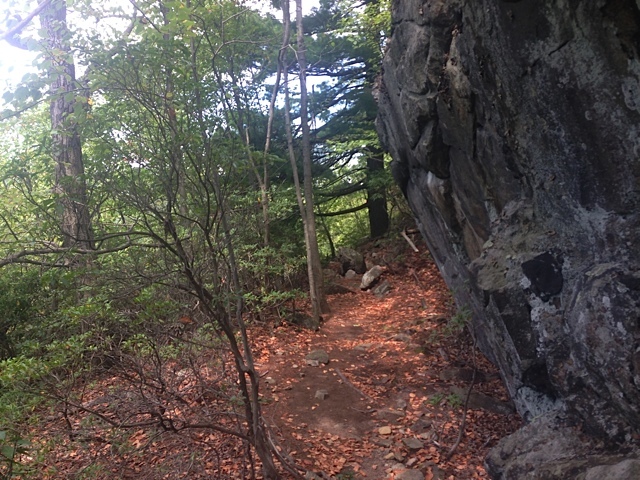 Shortly after the A.T. and Ramapo-Dunderberg trails split, the A.T descends Fingerboard mountain through some laurel groves and climbs a shoulder of Surebridge Mountain. This mountain is home to several mines, one of which was the Greenwood mine. 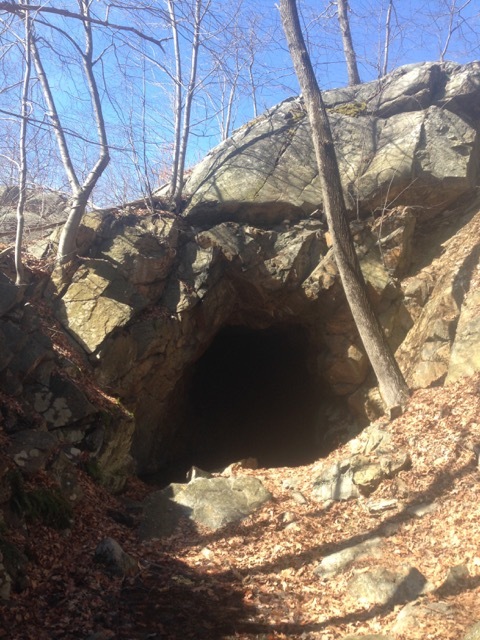 This mine is right along the trail as it follows the Surebridge mine road from that mine farther south up to this one. 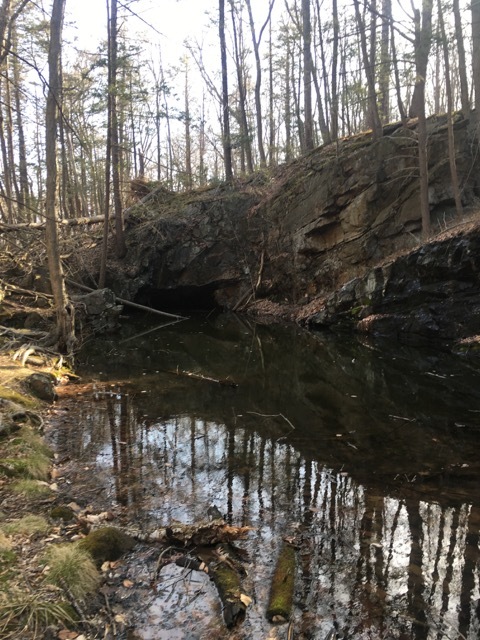 Its now a water-filled pit but you can see where the entrance was and the dynamite lines as well as the extracted rock on the other side of the old carriage road. 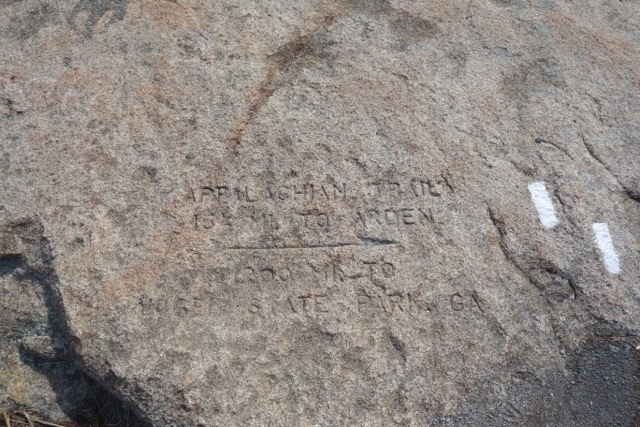 This ore was used for bullets for the parrot guns during the revolutionary war and was shipped to Cold Spring for manufacturing. 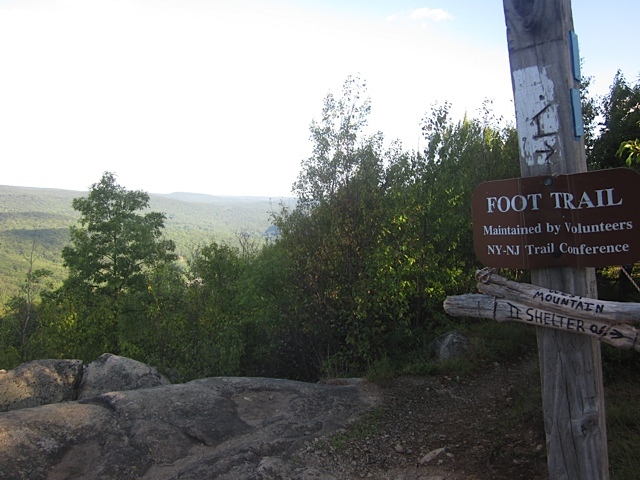 Soon after the trail intersects with the green-blazed New York Long Path, a several-hundred mile trail from Manhattan to the Catskills and beyond. We took some photos of the signs there and then headed down the back of Surebridge mountain where there was a nice brook. In fact there were quite a few good water sources running at this time. From there the A.T. climbs Island Pond mountain, with a nice place along its summit to have a snack and look back at the peaks of Fingerboard and Surebridge mountains. We did a taste test of two beef jerkies here and decided that the Boar’s Head brand was superior to the Field Trip brand from Starbucks. The reason should be obvious. Not one to waste food though we will finish the other packets of Field Trip. I just find it stringy and tough. 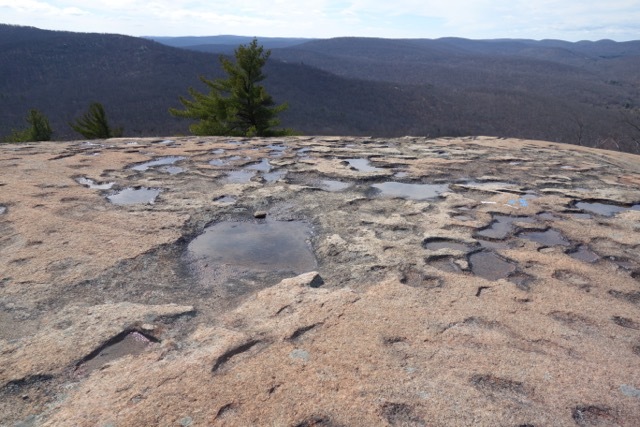 We had some nice views of Island Pond below as we made our descent down to the famous Lemon Squeezer. The squeezer itself was as expected, and a lot of fun. We have some great video going through that. But above the squeezer is where the tricky spot is. There is a blue-blazed ‘easy way’ around the side but that way isn’t all that much easier. Nevertheless being stubborn I wanted to try the slide down the 7-8ft rock face and gave Fielden my pack so I could wiggle onto the boulder that would guide me to my landing a few feet below. Only I guess I thought I was taller. Or it was shorter. 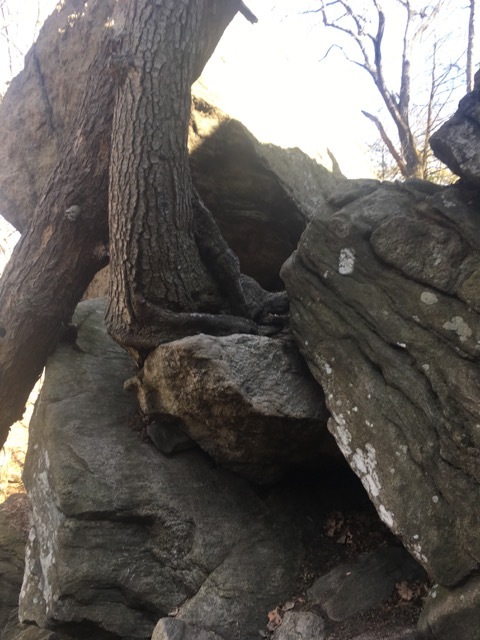 I had to slide between two trees down the outermost rock, so a fall meant falling off to the left, where it was at least 5-6 more feet down to more large rocks below. 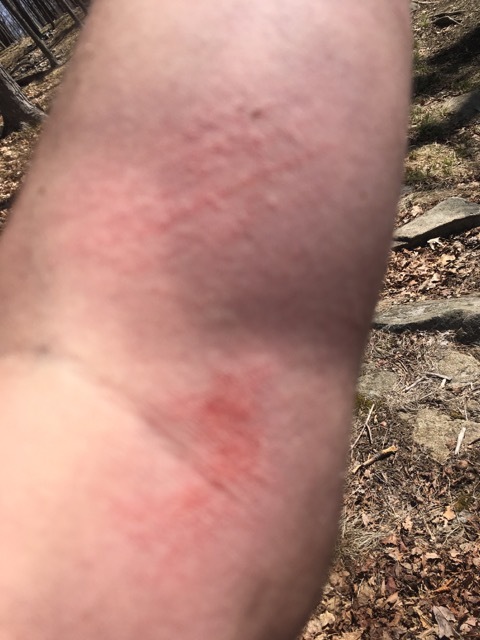 As I slid down my elbows took some serious scraping to keep me balanced, but that’s an acceptable alternative to a nasty spill here. Fielden Stream gave me my pack and took this as good motivation to go down the blue trail. We then made our way through the ‘fun part’ as a group of day hikers waited below. We watched them head up and stop at the upward route over the death rocks, wondering how many of them would go around. Honestly it seems easier going up, though it is not easy, to be sure. As we got to the bottom of the mountain and the trail reached the pond, we passed by what was at this point our third group of Boy Scouts and leaders out for an overnight. There were some nice stone canals we crossed here, which at one time used the pond to channel water to what I imagine was some sort of hydroelectric mechanism. A few folks were fishing and kayaking in the pond, and there is a gated road where fisherman can obtain a permit to drive down and fish here. There was one last climb for the day, and fortunately this side of the mountain was only a few hundred feet. Though at this point it was getting much hotter out and we were tired. On the other side of this mountain the trail descends twice as far to the lot at Elk Pen, so I’m glad we were coming from this side. We passed at least two more groups of Boy Scouts, another large group of backpackers, and many many day hikers on their way up the mountain. Even if the first group of scouts we passed shortly after leaving camp and descending Fingerboard mountain were going onto the William Brien Shelter 6 miles farther, Fingerboard was sure to be a full campsite that night. Also a bonus for us spending the previous night there. We reached the parking lot and waited for our shuttle from Suzy of MyHarriman.com. She reached out to me on WhiteBlaze when I was inquiring about shuttles in the area. They are offering free shuttles around the park. She and her husband picked us up and drove us back to the car and we had a great chat about the hike, and the park. I highly recommend you contacting her if you need a shuttle at suzy(at)myharriman.com. Technically there’s a scant 0.3 more miles of this section, to the route 17 crossing… but seeing as how we will be starting here for the section 12 hike, it will get done and I am marking section 11 complete. We hit the road, satisfied for the moment, and already planning the next trip at the end of the month. This weekend I have my wilderness first aid training. I am really looking forward to having those important skills when I’m out on the trail alone or with family or friends. But our packs are sitting in the corner of our bedroom, mostly packed and ready for the following weekend’s escape! 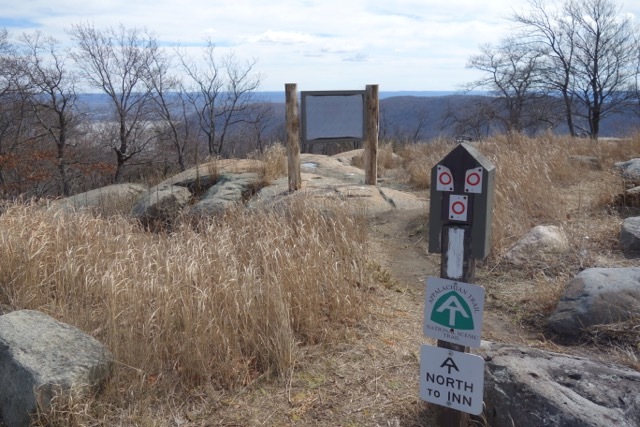 Either hike will have its challenges whether its West Mountain and the dash across the Palisades Parkway to Black Mountain, or the rock scramble known as “Agony Grind”. Either is better than, and a fine reward for, a 40 hour work week. Last weekend was the first time Fielden Stream and I were on the trail together, or hiking together for that matter, since we began this section with our final hike of 2015. 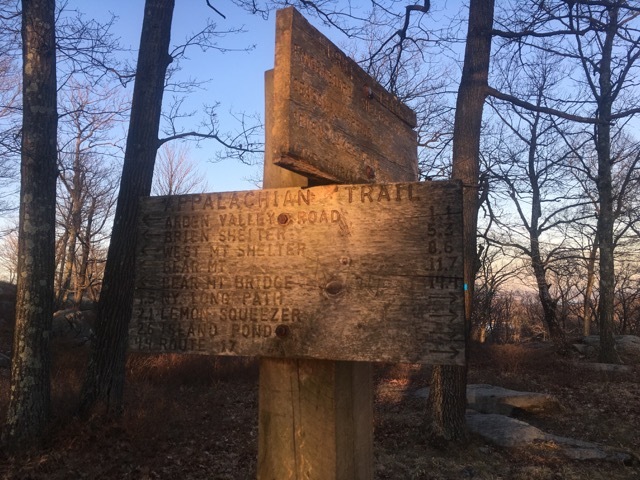 We were proud to have not only finished the last section of trail in Connecticut last year, but also covered 53 miles of the trail in New York — from the northern boundary at the Connecticut state line to Bear Mountain. 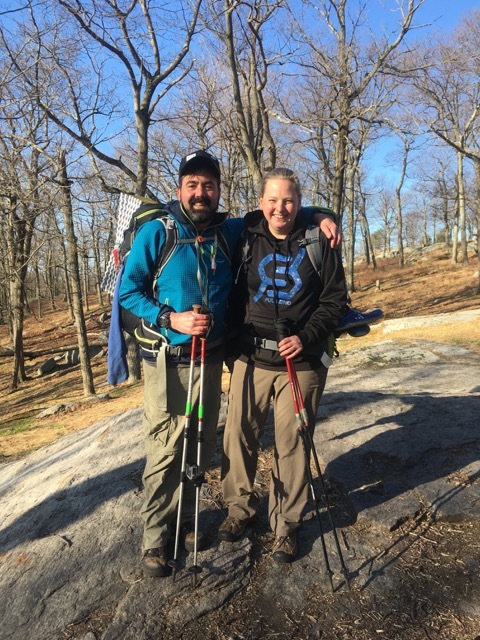 And so Bear Mountain was where we did our first hike this past weekend, to continue our trek across the New York A.T.
We celebrated that final trail night of 2015 at the Inn as it was her birthday, and did so this past weekend as well to celebrate our wedding anniversary. Our next hike together will be in about six weeks, when we finally finish section 10, and spend our first night of the season in our tent. At over 14 miles, this section is at least twice as long as most of the New York sections and with everything we have going on at any one time right now, we’re lucky when we can get away for more than two days / one night of hiking. Regardless, it was a joy to be out there again together, passing white blazes in tandem for the first time in six months. 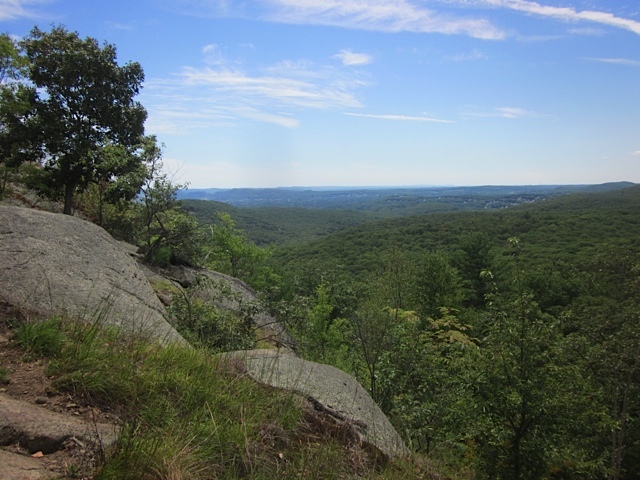 As I’m sure you know, in between and nearly every weekend, I’ve been hiking — either solo as an AMC volunteer on the Connecticut section or other local trails, or on group outings. But these hikes together are extremely special to us and this was no exception. 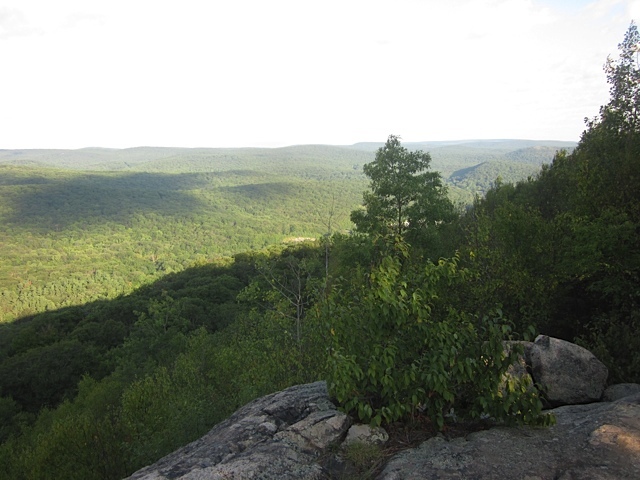 And I have more day hikes and volunteering in Connecticut to do to keep me busy until our overnight in April. 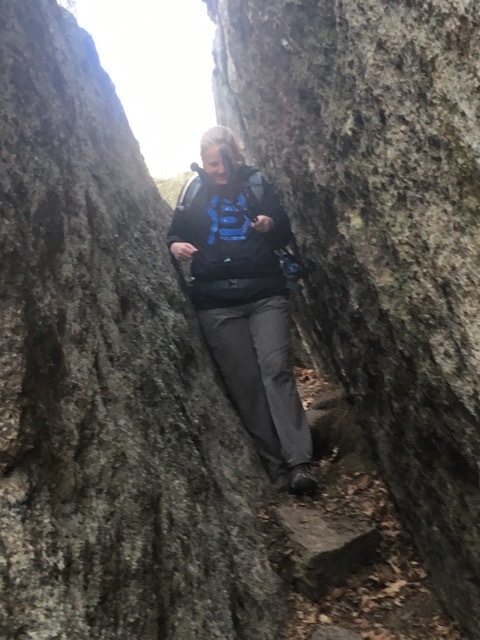 If you’re reading this regularly you may also recall that our first section hike together ever was in the fall of 2013 up the impressively steep Major Welch trail (once the A.T.) on the north face of Bear, and down the A.T. from the summit to the Inn. So this time we just needed to out-and-back up the south side of the mountain to connect the dots from our final section of 2015 this past October. We did the hike today northbound up, and southbound down. I was eager to see all the incredible new rock work volunteers had done on this section over the last few seasons, which was showcased with a ribbon-cutting last fall. We parked at the hiker lot just off of Seven Lakes drive, nestled in the gap between Bear and West mountains. It was a relief to start on a Friday vs a Saturday, as I didn’t stress over the parking being full by the time we got there. It’s about an hour drive from home, and we were waiting to leave until the end of the morning rush hour, to avoid turning it into a two-hour drive. Only once have we gotten to a lot and found it full, but it provided enough anxiety that I decided starting on a workday to have less crowded lots and trails was worth the vacation time. 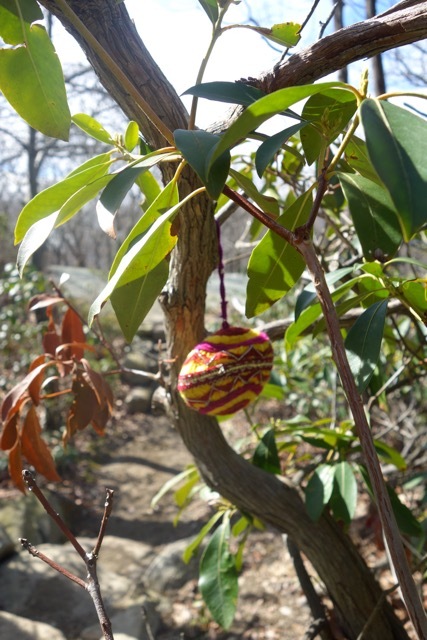 Shortly after leaving the parking lot on the historic 1777 trail, it joined the A.T. and we headed north through one of many groves of mountain laurel. 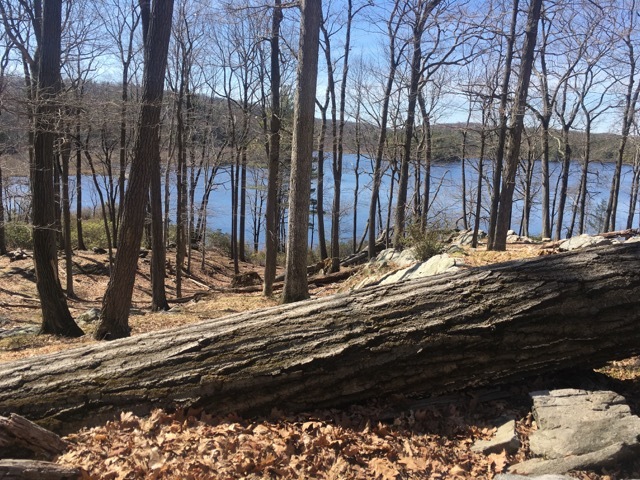 Soon after, the 1777 trail split off on its path down the old Doodletown road and the northbound A.T. crossed 7 Lakes Drive headed for the summit. 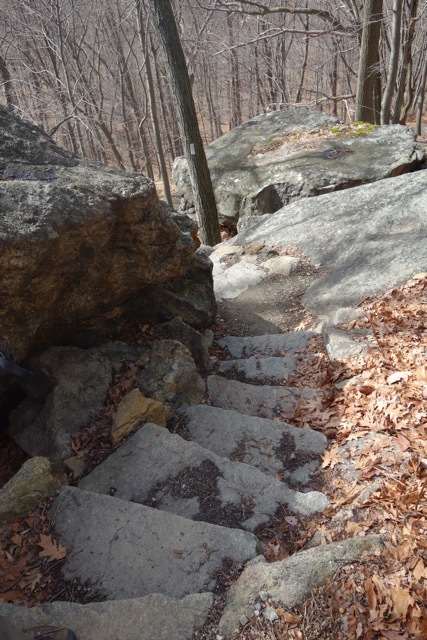 Almost immediately we were treated to displays of fine stone work and even rebar handholds as the new trail wound up the hill through glacial erratics and over terraced stone slabs. After ascending the first crest we were treated to a symphony of (mating?) frogs in a pond nestled in a rocky valley, with the sounds of croaking filling the air. Unfortunately, despite two attempts to capture the audio, my GoPro’s lackluster microphone did not capture it and I wish I had just taken the second video with my iPhone. 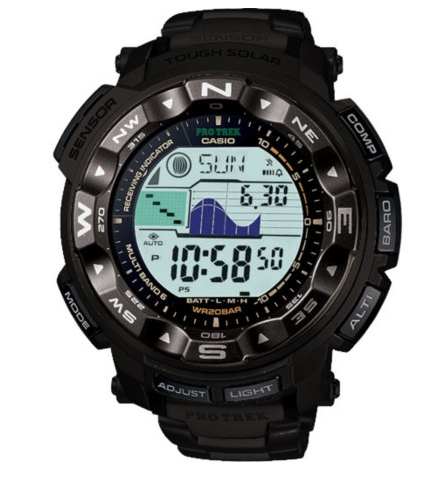 Audio is not something the GoPro excels at… but I use it for our video channel. Check out the ‘links’ section. So far we have made a video for Connecticut, though I didn’t get the GoPro until we were almost finished with that state so most of that video is stills. My son “Jiffy Pop” made the music in Garageband; it’s cool stuff. I’ve been working on and adding to the New York video as we go, and since we plan to finish the state by fall I will put up the New York video before the end of the year. The trail then crossed Perkins Memorial Drive, the seasonal road that takes tourists to the top of the mountain the easy way, and then heads along an old unused portion of the road that was decades old. 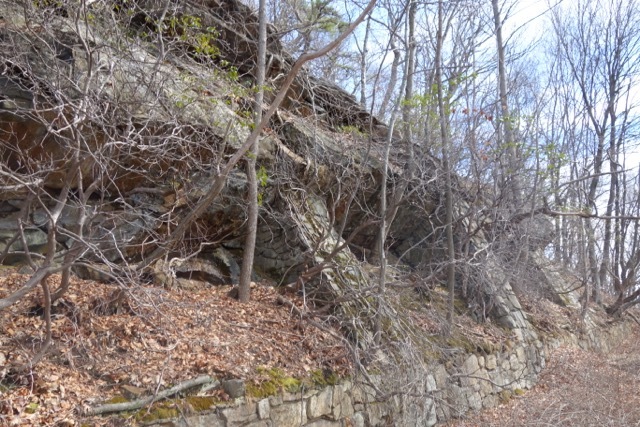 It was lined with impressive stone buttresses that were holding up the rock cliffs overhanging the roadway. Clearly, these were not preventing enough of the higher loose rock and debris from sliding into the road, and hence they took it out of service. That’s our guess anyway. 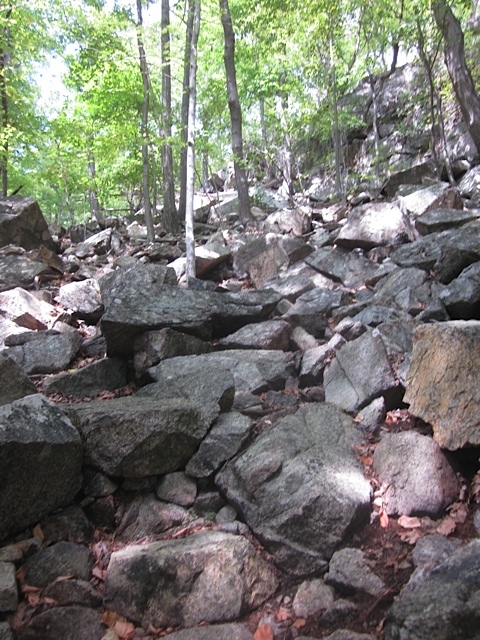 A short distance past these, the trail ascended more well-hewn rock stairs up that rock face until leveling out and following the tops of those rocky ledges to a wide open vista facing southwest. Here there is also a short blue-blazed trail that follows these ledges a bit farther out to a view point on the western shoulder of the mountain. On our return I did explore about three quarters of the way out while Fielden took a break. We took a quick snack break here on the way up as well. We then followed the western ridges of Bear through some more laurel groves and past the blue-blazed summit shortcut we would take back. 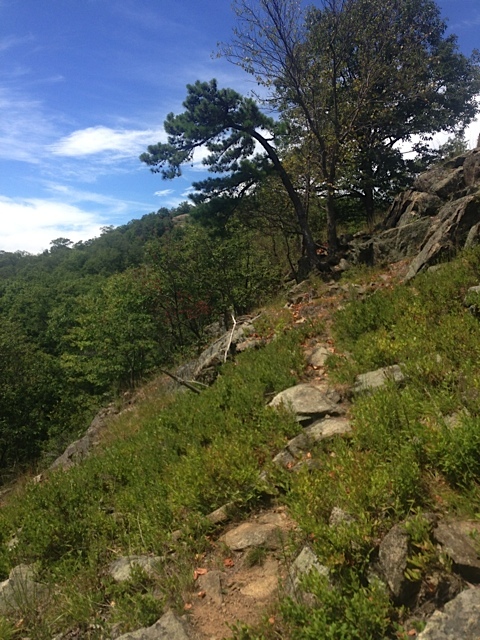 About half a mile later the A.T. runs concurrently with the steep Major Welch trail, with its sweeping views north up the Hudson to Storm King and beyond. 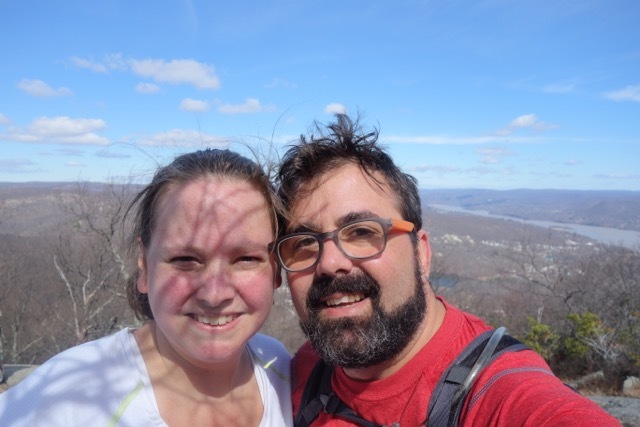 We reminisced about our first big hike here together and took some photos. 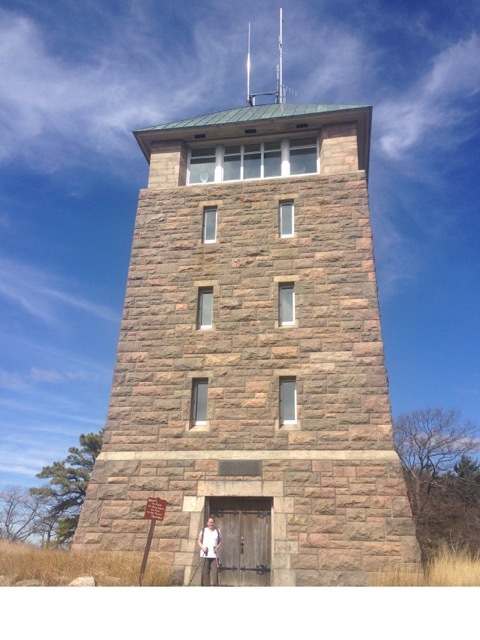 The combined trails traverse the summit to the Perkins tower. There is also a large handicapped-accessible loop around the top of the mountain here for those who drive up and want to experience some of the views but have limited mobility. We had a nice snack and took in the views once again at the top. We were expecting the tower, the vending machines, and at the very least the restrooms to be open, but none of them were. I guess it makes sense since the road was closed at this time. But, it was a bummer. We took some more pictures, had lunch and observed the interesting mix of those who had also ventured up the mountain in various ways, including a small lapdog. It seems somewhere in the area you can rent a powered bicycle and ride it up the Perkins drive. We saw only one pair of backpackers this Friday morning, though we did see many heading out the next morning from the parking lot at the inn, as it was a Saturday. We headed for the shortcut on the other side of the tower and headed back down the mountain to the car. It was a clear, warm and beautiful day and we were elated. We had a nice dinner down the road in Tomkins Cove, passing two or three other trailheads in the park on the way. 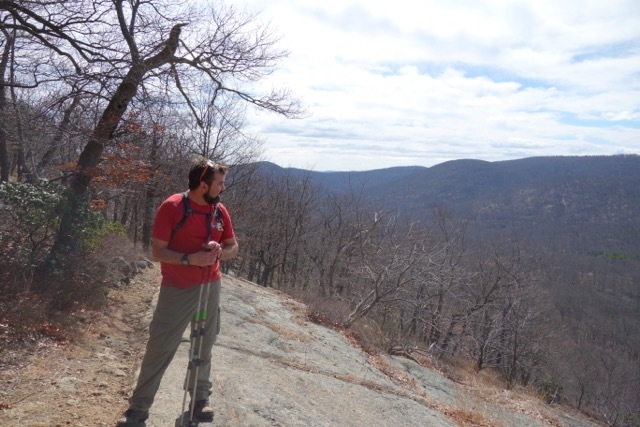 The next morning we headed for those trailheads, which turned out to be for the 28-mile long Ramapo-Dunderberg trail as well as the beginning of the Timp-Torne trail, which also crosses the park, and ascends many summits. I hiked on both of these on my solo hike last summer. 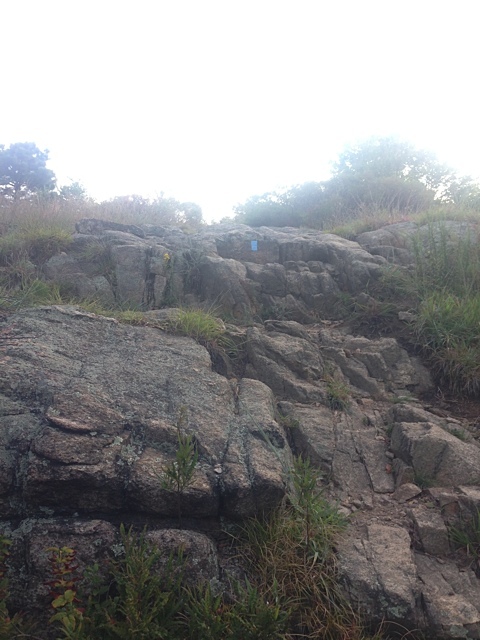 We started on the merged trails from the lot and it ascended quickly and steeply. There were no stairs here to speak of. Just rough, steep trail. 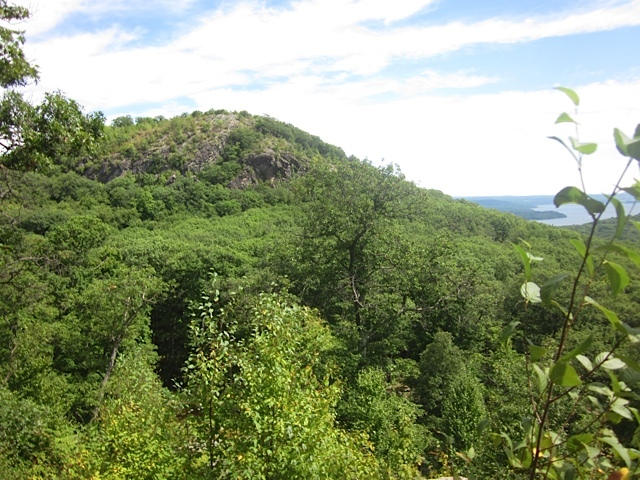 We split off on the Timp-Torne at the junction and it continued to rise and skirt the ledges, providing a challenging and exciting hike. We had just a few hours before we had to head back, so we climbed about a mile and a quarter up the mountain before taking a short break by a brook and headed back down. There were some really interesting features on this trail. Along the road at the start was a tunnel from the abandoned Dunderberg Spiral Railway, and about 700ft up the mountainside was a graded path and a large cave-like opening in the rock. It looks like it was originally intended to be another tunnel, for this path, but they only blasted on one side before giving up. Seeing as how it was filled with water when we saw it, perhaps that was a problem at the time as well. 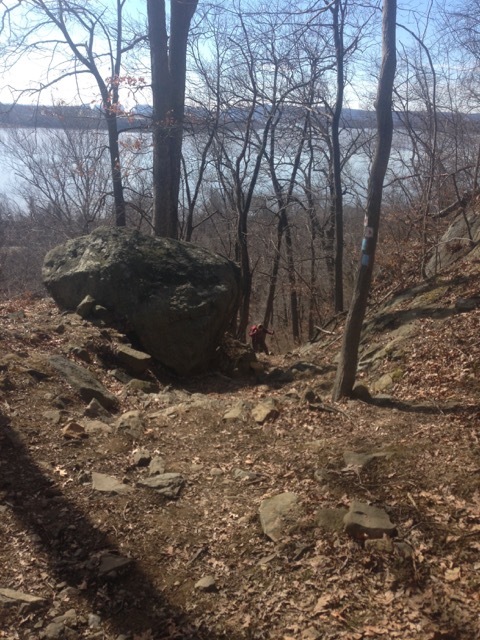 So the graded trail skirted instead around this rock wall on an equally wide man-made path along the ledges. 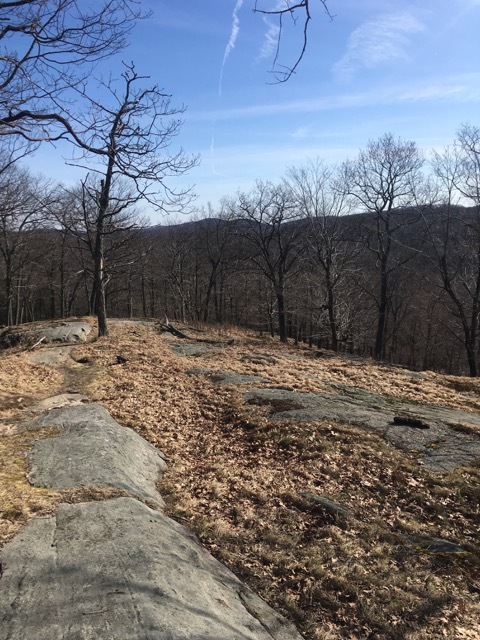 There was also an unblazed, unmaintained trail called the Jones trail that once led steeply up from the road and crossed the Timp-Torne trail near our turnaround point and continued up to the top along the Ramapo-Dunderberg Trail. I am guessing this was an old route for getting supplies up to this point. I will definitely look into it more. 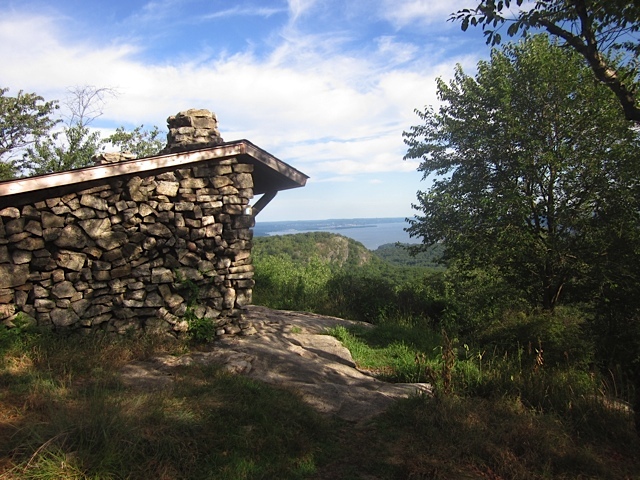 On another occasion I will come back here and complete the climb over Dunderberg and Bald Mountains, perhaps spending another night at West Mountain with its glorious views to New York City. 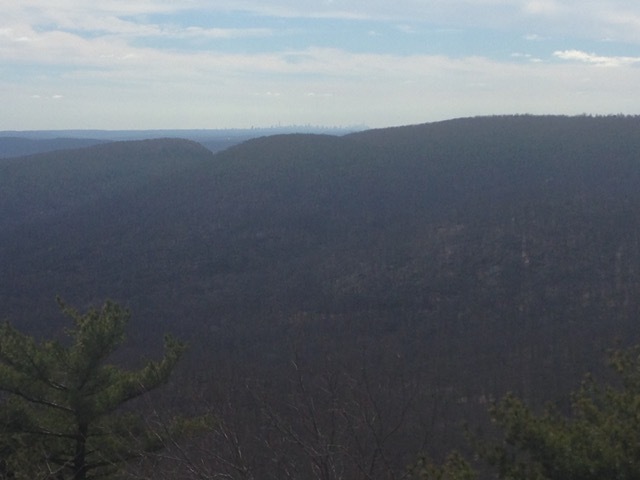 The only negative to this hike is the sweeping views to Indian Point energy center and it’s smokestacks and loud announcements. I couldn’t make out the words so I kept joking that they were paging Homer Simpson to wake him up from a donut-induced nap. 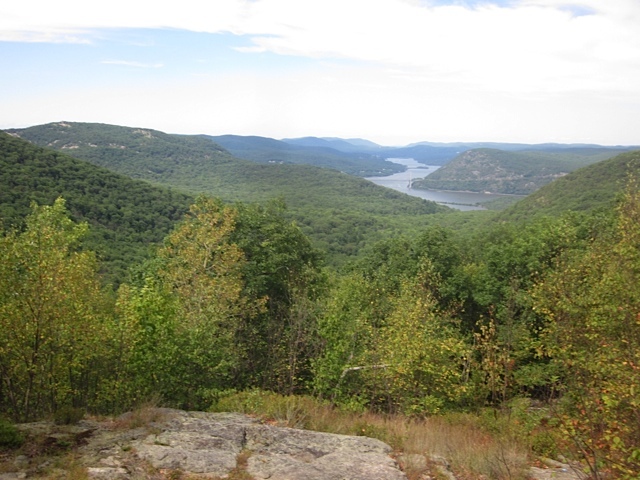 Bear Mountain and Harriman State Parks offer a lot of challenging, scenic, and varying terrain with hundreds of miles of trails and beautiful lakes. All of those make it a popular spot to come back to repeatedly. 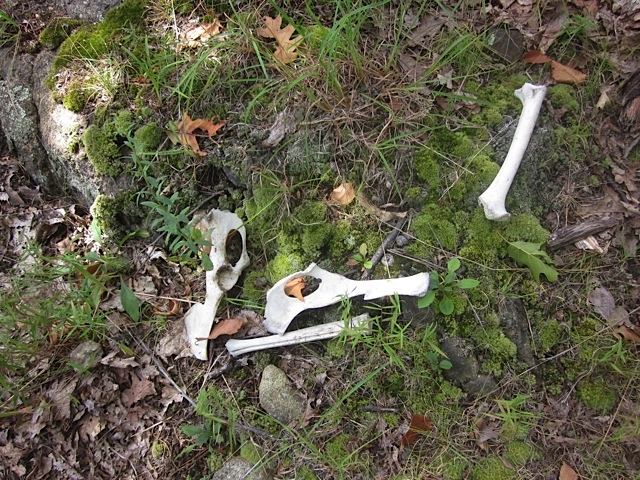 And I look forward to returning next month with Fielden Stream as we continue on our Appalachian Trail adventures. 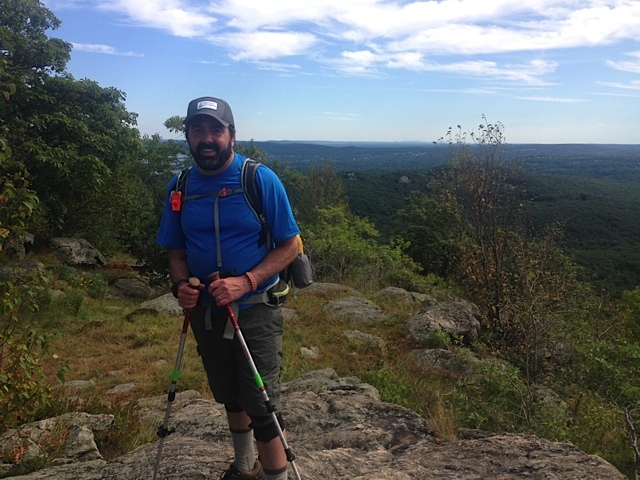 This weekend i will be joining my AMC club on one of their two Ives trail hikes in Connecticut, to finally complete that entire trail.